July last year I received a call from a very sweet man, Paul, a husband looking for the perfect gift to give his wife. Paul told me his wife had done a glamour shoot for her 40th. He thought it was a great idea to gift her another glamour shoot for her 60th, a personalised gift voucher for our You are Beautiful photoshoot experience. As time went by in July I kept on waiting for the call from her to book in, nothing happened. Month after month went by and still no call. Fast forward to January this year, the phone rang … Hi it’s Cheryl here …. Woo Hoo, finally the call I was waiting for. Cheryl was excited and was ringing to book in for the shoot. She was sorry it couldn’t have been earlier. She had been so busy travelling after her birthday that time had slipped away. We settled on a date and confirmed with my trusted and preferred Make up Artist (Morgan from Morgan Leigh Makeup Artistry) that she was available. On meeting Cheryl in person I quickly discovered what a wonderful and bubbly lady she is. Cheryl has a laugh that is infectious. Her stories about her life, family, travel and girlfriends are captivating. This is a true lady who lives life to the fullest and makes every day count. On her 60th Birthday they had a party with a dress up theme of “Bollywood”. Let me share with you it’s not the first dress up party she has attended. It seems to be a normal occurrence in her life (and Im not just talking about finding something ok from the wardrobe that will do, Im talking full 100% commitment). She had bought in the outfit that she wore to the party and asked if this could be one of the looks for the day, of course I said yes … let’s do that one last. Cheryl loves her scarves and I think she has over 100 different ones in her wardrobe. Cheryl bought a small selection to our shoot, all colourful and co-ordinated with her outfits. Although taking Beautiful photos of Cheryl is my job, it didn’t feel like it, we were laughing often and during make up “touch ups” listening to her travel and learning about her life, it was an absolute joy, I honestly feel that the universe had given me this gift and not the other way around. After a couple of weeks, we met again so I could present her photos, let me tell you it was hard to narrow down just to the favourites. Cheryl was beyond delighted with the results and chose 7 must have photos for printing. Our time together went so quickly, I am grateful to leave her with beautiful photos of a beautiful lady and more great memories for her to cherish. The studio has fresh paint, new timber flooring and I have some new lighting accessories to play with. It’s the perfect time to organise a photo shoot. Last week I was contacted by a very good friend and fellow photographer Steve O’Brien from FotoZero, enquiring if I was available for a “baby bump” shoot. It was the opportunity I was waiting for to try out some creative lighting photos. So a date was set for last weekend. Meet Chloe. Chloe is 39 weeks pregnant with Jackson. Chloe has had some challenges within the pregnancy and to keep both Chloe and Jackson safe, Jackson is due to be born this coming Sunday (which is also his due date). There is something extra special about a pregnant woman, it is like nature, an indescribable beauty. Chloe is no exception, she is glowing and her smile lights up my studio. I have a specific type of shoot in mind I want to show off her belly as well as her body, as a celebration and documentation of the miracle of life in raw black and white form, this is where my new lighting “toy” comes in. For the first half of the shoot I am using a large soft box over my light source positioned facing away from Chloe into my “white” space to bounce back a soft spread of light. My main light I am using has a beauty dish attached, pointing straight at Chloe. My vision is to capture the quiet moment where Mum and Baby Bump are one, a powerful love and moment where one is just enjoying the feeling of a swollen belly and the little and not so little movements that one experiences at this stage of the pregnancy. I want these few photos to silently speak of the love and emotion and I am choosing to process in Black and White. I believe by taking away the colours you are drawn to the moment. This is what I aim to achieve. The second part of my vision is to use the lights to “enhance” and “direct” the light on all or certain areas of Chloe, again showing off the beauty that is a woman’s body with child growing inside. I want that raw beauty and again process these in Black and White, I want Chloe to have a memory that shows off her beautiful pregnant body. In my last photo I asked her partner, Mason to join us and arrange for him to wrap his hands around her and rest on the belly – directing the light onto the bump and his hands, this photo to me is a family full of love excitingly waiting to meet their precious little boy. I am truly blessed to be asked to capture these memories and wish Chloe, Mason and little Jackson a very happy and healthy life. What does a You are Beautiful photo session feel like? I would like to share with you a little about a truly amazing woman I had the pleasure to have in my studio for a full day ‘You are Beautiful’ photography session. Meet Bailey, a wife and mother of 4 children, the eldest is age 12. Bailey met her husband in High School about 15 years ago. They fell in love and the rest, as the saying goes, is history! Now if you think that having 4 children and a husband is enough to keep anyone busy, add in a full time career in the very busy corporate world and you start to get a picture of how much of a super woman Bailey is. Bailey’s friends describe her as a very generous person, hard working, a loving wife and mother and someone who never stops to consider her needs above those of her family and friends. It was Bailey’s friends who encouraged her to take some time out for herself and book a ‘You are Beautiful’ photography session. Bailey arrived at the studio at 10am and although nervous she was ready for a day that was ‘all about her’. After a consultation regarding our wardrobe selections for the photography shoot, my hair and make up artist and stylist, Tami from Tami Perrin Hair & Makeup (also Dr Dread) transformed the ‘everyday Bailey’ into a much more ‘glamour Bailey’ giving her the ‘You are Beautiful’ – 5 star make-over treatment. We were now ready to shoot. Both Tami and I agreed that Bailey looks sensational however Bailey’s nerves were getting the better of her (remember, this is something she has never done before) and she was feeling a little anxious. We decided a little ‘dutch courage’ was needed (translation: a small glass of champagne and a good old fashioned pep talk from me) . I’m not sure which one did the trick, Bailey now appeared relaxed and comfortable in front of the camera as she put her trust in my ‘You are Beautiful’ experience. A couple of outfit changes and some stunning images later, we took a break for lunch. It was lovely to unwind, rest, chat and enjoy a cheese and nibble platter in our relaxing lounge area. After lunch Tami adjusted Bailey’s makeup and styled out her hair with more volume as we headed into our final 2 looks, the ultimate in glamour and cocktail outfits. Bailey was now well versed on the posing and giving her body a workout that can only be described as Yoga come Pilates, I call it ‘yogalates’, (a workout which Bailey telephoned to thank me for the following day 🙂 ). By now we were really in the groove and the images shone with personality. At the end of the day we got a couple of photos “just for hubby” and then the whole ‘You are Beautiful’ photography session was over. Before Bailey left, we had a look through the photos and she selected a few front running favourites. I couldn’t resist and whilst Bailey was driving home, I processed her favourite and texted it to her, thanking her for trusting and sharing herself with me for the day. No matter who you are or how busy life gets I think we all agree that every woman deserves a little ‘time out’ and pampering now and then. What better way to do that than with a ‘You are Beautiful’ photography session. Call me to book today 0421 279 213. When booking mention this blog and I will give you 10% off your session and a $55 print voucher as my gift – valid until 31 July 2014 only. I am so excited to share with you a beautiful story of a truly special girl who I had the pleasure to photograph in my studio. Meet Jaz. When Jaz was growing up she thought she was just like any other girl, a bit of a tomboy who also liked being the centre of attention. As a young girl, Jaz was a creative person who enjoyed singing, dancing and acting and she dreamed of one day becoming famous doing what she loved. At the age of 14, a family contact suggest Jaz try to get into modeling. Jaz was unsure about modeling as her dream was to become a world famous actress, not a model. However Jaz agreed to go for an interview with the modeling agency and to her surprise she was signed straight away for modeling, acting and dancing. Jaz only told her closest friends she was signed with a model agency. At School Jaz was constantly bullied for being a little different, she dressed differently to the “cool girls” and they didn’t like anyone being “different”. These bullies discovered Jaz was doing fashion shows in shopping centres and just couldn’t believe that the “punk girl” who sat up the back of the class was a glamour model. Jaz modeled with that agency for just over a year before they closed down. Modeling didn’t shop there for Jaz. A local photographer ‘found’ her and would take her along to camera club meetings where she modeled for portraits. Exposure to all these photographers helped Jaz learn about posing and being in front of a camera. During this time, Jaz competed in modeling competitions and placed well. About 4 years ago Jaz met her love, Michael. Six months after meeting they found out she was pregnant and 9 months later she gave birth to a beautiful boy, Corban. Modeling life was put on hold for a short time, not only to concentrate on being a mum to her beautiful boy but also to take time to get her body back in shape. Jaz did return to modeling. Jaz was on a train, returning home from a photo shoot, when a group of girls assaulted her. The assault didn’t result in a lot of physical damage but the mental damage scarred her and changed her deeply. Her son was not even one and the assault left Jaz suffering with diagnosed Post-Traumatic Stress Disorder. She was afraid to go anywhere alone and she couldn’t bare the thought of modeling. Jaz eventually found a modeling group called TrashDolls. TrashDolls are a Melbourne based group, the girls are all a little different, they are all girls that felt they didn’t fit inside the little box that society calls “normal”. They are about ‘trashing the perception of perfection’ and they call themselves “dolls”. Outside of her family and close friends it was this group that gave Jaz the love and support she needed to get back on her feet. Jaz created and models under the name of Venom Miss Symbiote, it is her way of keeping the modeling life separate from her personal life. It is a great way to realise her alter ego without reflecting on her personally and her family. The name came from the Marvel anti-hero The Venom Symbiote. Jaz relates to the character and friends often joke that when she gets mad or does something out of character, it’s the Symbiotes fault. Jaz has been with TrashDolls for a few years now. She believes so strongly in the dedication, honesty, teamwork and support that TrashDolls appointment Jaz the State Manager of Queensland. Jaz is such an inspirational and wonderful woman. Whether as Venom Miss Symbiote or Jaz I believe we can all learn something from her, especially her outlook on life: “When you truly love something never give up no matter what life throws at you”. Jaz is a very humble and down to earth person with a beautiful soul. It was an absolute pleasure to photograph her and in the process get to know more about her. Valentine’s day, the day we associate with roses, chocolates, valentine cards, that long lost romantic message in a bottle… It is the day you declare your love and affection for that someone special in your life. We here at Solo Images Photography know how to treat the girl/lady/partner/wife/mother/love of your life like a princess; pampering, styling and photographing her how SHE dreams to be photographed. A Solo Images Photography Gift Voucher for a You are Beautiful experience, is the perfect gift this Valentine’s day. Give her the gift that makes her feel as beautiful as you know she is. Make this Valentine’s Day more than an exchange of chocolates, cards and flowers, show her how much you care, do something out of the box and book her in for a You are Beautiful glamour photography session. 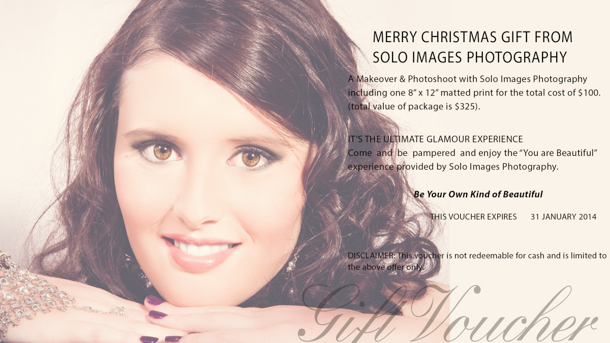 Please contact Solo Images Photography on 0421 279 213 to book.